FlexStand is an exclusive series of iPad holders designed with flexibility in mind. The products in this series are coined as "universal" because they adjust to fit most 7"-10" tablets! Watch this video to see why everyone loves FlexStand tablet holders! 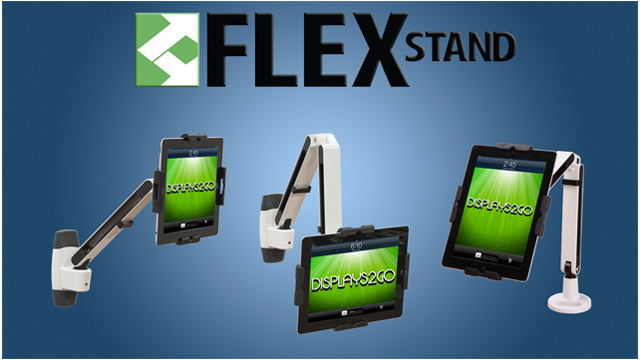 TEXT: "Innovative tablet holders designed for dependability at smart prices only at Displays2go - Exclusively by Displays2go"
"The Flex Stand brand is unique to Displays2go"
"What can you expect from this line?" "Adjusting Bracket for Universal Compatibility"
"Articulating Arm for Perfect Placement"
"A Functional & Affordable Business Solution"
"Flex Stand - Discover our other innovative branded tablet holder today."